Pakistani Shiite Muslims march during a religious procession on the ninth day of holy month of Moharram in Karachi. 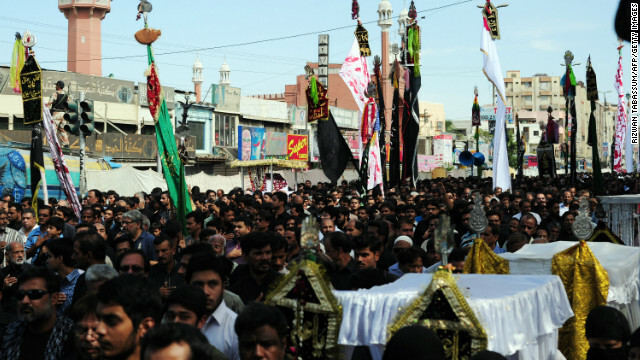 Islamabad, Pakistan (CNN) - For the second time in two days, a deadly blast shook a northwest Pakistani city as worshippers marked the sacred holiday of Ashura. The explosion occurred near a Shiite Muslim procession in Dera Ismail Khan. The bomb was planted inside a bicycle repair shop, killing five people and injuring more than 70 others, said Mian Iftikahr Hussain, the provincial information minister. The spokesman for the Pakistani Taliban, Ihsanullah Ihsan, said the group would continue "its mission" and attack Shiite Ashura processions across Pakistan. The Sunni-Shiite blood feud (e.g. Iraq, Syria and Pakistan) and the warmongering, womanizing (11 wives), hallucinating founder.